Lanvin Silver Coated Calfskin Partition Camera Bag: Smile for the Camera! Camera bag, that is. 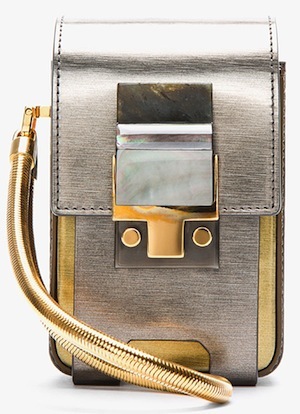 How fun is this baby Lanvin wristlet for summer travels? I love a bag that has no qualms about leading a double life. This one will actually hold your digital camera as you take in the sights all day; then come nightfall, take it out as the perfect after-dark wristlet. The size holds exactly what you need and nothing more: phone, lip gloss, ID, and credit cards. If you recognize it, that’s because this is a reissue from last year with a variation. 2012’s crossbody strap has been replaced with a snake-chain wristlet. Which turns this etched, metallic gem from sight-seeing accessory to party-starter. Pair with: A sick statement ring makes for a dream accessory (at a fantastical price). 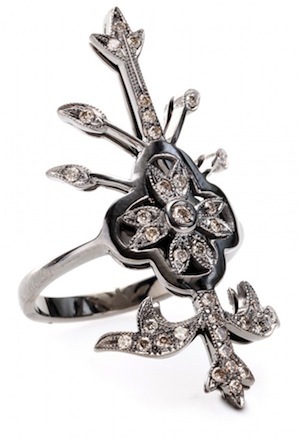 Robert Marroni‘s oxidized gold and brown diamond ring is fit for a medieval rock vixen. On My Theresa for $3,666.